The first benchmarks for the new retina MacBook Pro, MacBook Pro 2012 refresh, and the updated MacBook Air 2012 have shown up from GeekBench and, as you would probably expect, they’re very impressive. 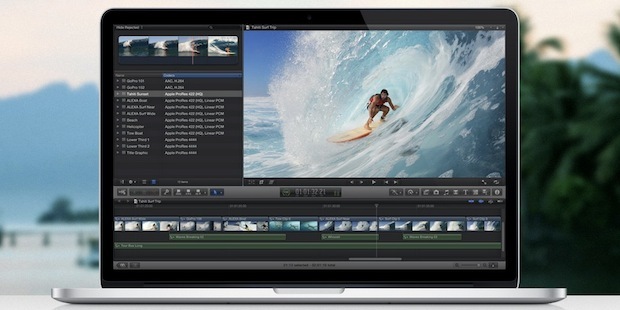 First up is the new MacBook Pro 15″, which is easily the fastest Mac laptop Apple has ever made. The preliminary Geekbench scores top out at 12,303 for the non-retina and 11,844 for the retina model, but it’s important to note the non-retina model as tested has a slightly faster chip speed and so the top of the line next-gen MBP 15″ will likely end up as the fastest. 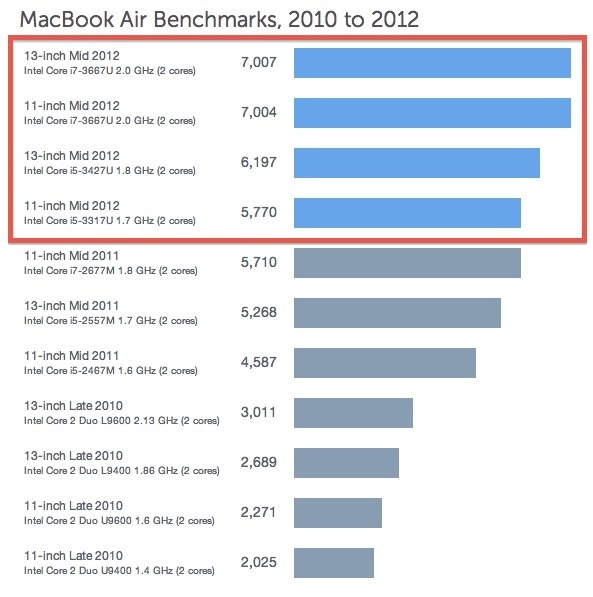 Each of the 2012 MacBook Air models also show a nice speed boost from the previous generation, but where you’ll really notice a huge performance boost is if you’re upgrading from the 2010 models. The biggest gains are experienced by the top of the line models, though basically even the slowest models from the mid-2012 refresh are now faster than the 2011 speediest. This is mostly the result of the new Intel Ivy Bridge processor architecture at work, but for anyone who gets an Air or retina MacBook Pro your Mac will feel even faster thanks to their speedy new SSD drives as well. If you’re thinking about upgrading, any upgrade from last years models are going to be a nice improvement, and if you’re coming from 2010 or prior models you’re going to experience gigantic gains. This is really a great time to be an Apple fan, if you are going to upgrade soon don’t forget that any Mac bought between now and July also comes with a free copy of OS X Mountain Lion when it’s released next month. GeekBench is a fairly limited performance indicator because it only stresses CPU. You really want something to test all-around system performance, and, for many of us, games, which are perhaps the best indicator of GPU performance. I bought a new MacBook Air and I am very excited. Im probably going to get either a 2.3 retina or a 2.0 13inch air.. but I can’t say Im gobsmacked but the results.. in some cases its barely F all.. Im not going to lose my mind over the computers now being 1% faster – like 10,600 now at 10,800.. thanks ivy bridge.. disappointed. Everyone was raving on like it was at least 20% difference. My MBP 17″ 2.5Ghz scores a 11711. So much for an increase with Ivy Bridge. Ultimate fail Apple for getting rid of the 17″ MBP. 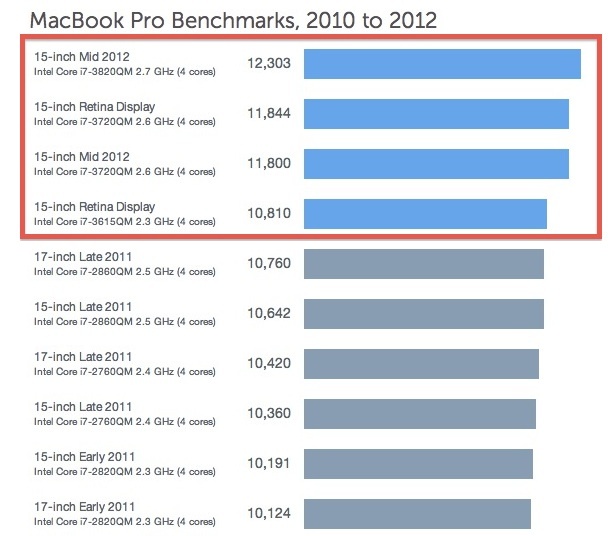 Macbook Pro 13″ 2012 model benchmarks are missing.